Our house is a 1 & 1/2 story 1903 frame house. Like many older homes, it has seen its share of changes and renovations over the years. When houses like this were built, the second story (the "1/2" story) was usually left unfinished, serving as a bare attic for storage. Eventually, many of those were finished, and expanded with gables and dormers and such. 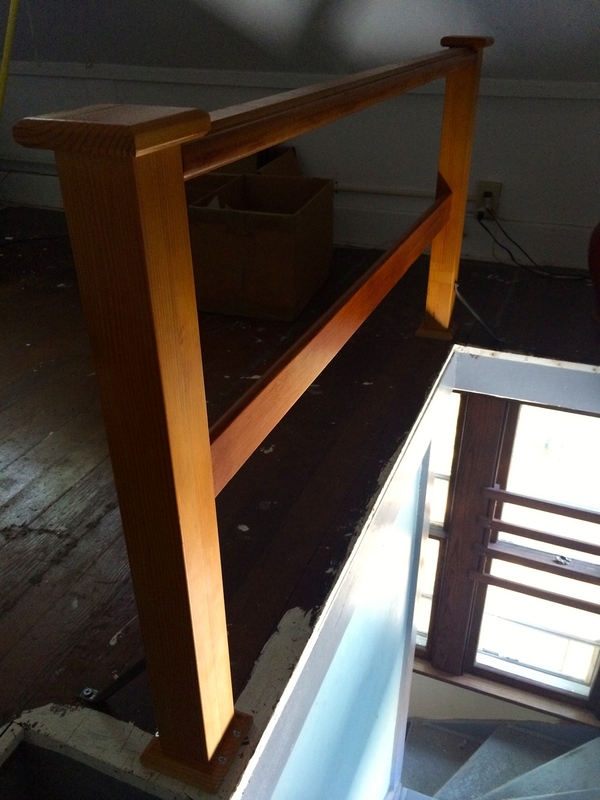 The second floor in our house seems to have been originally accessible only by an exterior stairway, off the back porch. When the back porch was enclosed, and made into an expanded kitchen many years ago, the roofline was extended, and it absorbed the formally exterior stairs. There was no gable or dormer expansion of the second floor, and that left a stairway that wound up onto what we nicknamed "the slanty room", due the slope of the roof on all sides. Today, that means that one has to lean towards the inside of the room when using the stairs, which is a little awkward. Also, anyone in the room would face a potentially long drop if they stepped off the edge into the stairwell. To make it all a little easier and safer to use, a four foot hand rail was made/installed sometime back in the past. The hand rail was made of pine, varnished, and then screwed into the floor. It was a nice detail, but over time, the base of the handrail split, loosened, and wobbled terribly. Several weeks ago, I decided to rebuild it, keeping it as true to the original as possible. At first, I intended on just replacing the cracked bases, to give a fresh place for the screws to attach. But after pulling off the bases, I saw that the two upright posts were in pretty bad shape as well. They were not solid; merely four sided hollow boxes. Not only that, but the joinery on the whole piece was pretty basic: lots of nails. Lots, and lots of nails. 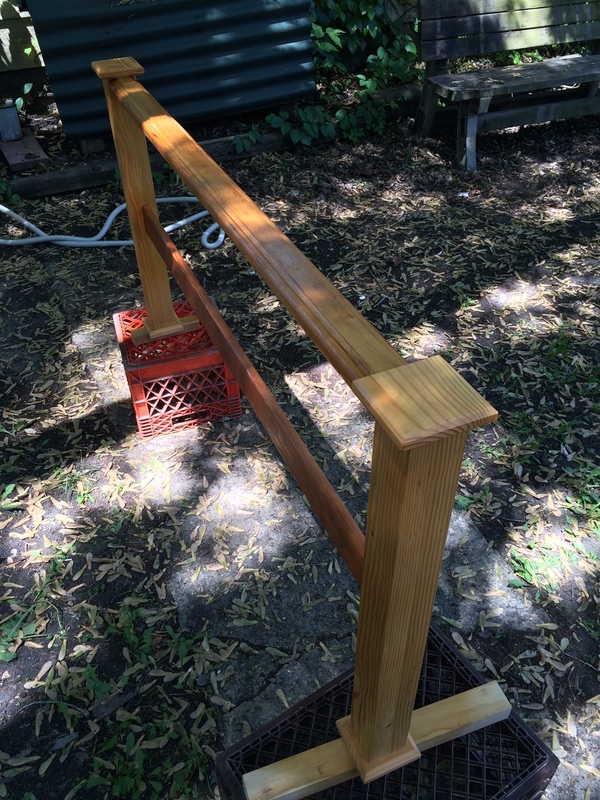 If I was going to rebuild the posts, that meant getting new material, and that nice aged patina on the rails was not going to match the new stuff. That meant I had to get the surface of the rails down to the bare wood, and finish both the old and new parts together. At first I tried sanding the old finish/patina off, but either the grime and dirt that had built up over the years, or the old varnish, (or a combo of both), made sanding it off impossible. Within a few strokes, the sandpaper would load up with a sticky wad, rendering the paper useless. So I got out my hand planes and card scrapers, and removed the least amount of material I could get away with. That went well, and soon I had clear, clean stock. I then glued up some douglas fir stock for the approximately 3"x3" posts, and milled those square. 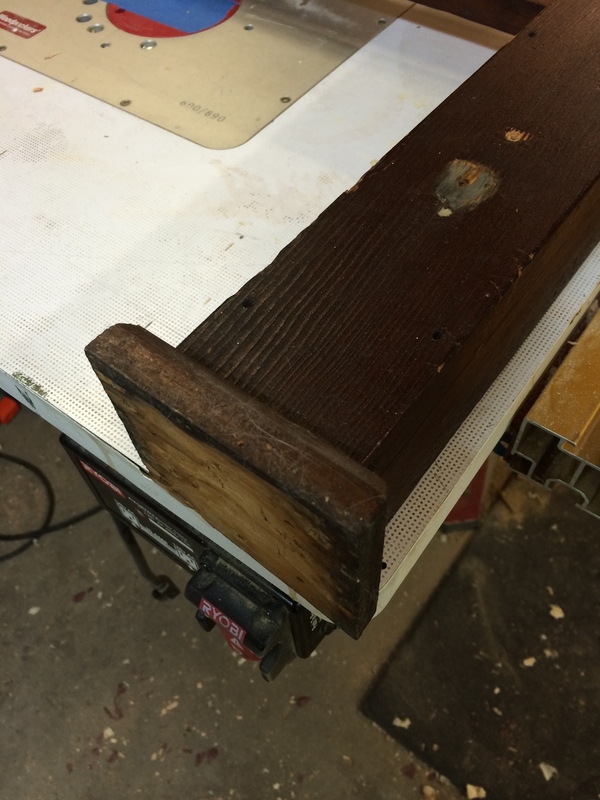 With the posts being solid wood, and to longer hollow, I could cut a proper mortise for the lower rail to sit in (in the original, the bottom rail's tenon went to the open space inside the post - pretty weak, and was nailed in - also pretty weak). I made a half dovetail to secure the top rail. I only did a half dovetail, because I afraid of weakening the "tails" by removing too much stock from both sides. I milled up simple chamfered bases and caps, screwing and gluing the bottom bases into the posts, and then cowling and glueing the caps to the tops of the posts (I didn't want to screw down from the top for aesthetics). Then it was on to finishing, which was several layers of garnet shellac, sprayed via HVLP. I was hoping it would have turned out darker, but I think if I wait another 50 years, it will get there. It look great this way, and will will darken with time. I'm in no hurry. finishing in my "spray room"
Once the layers of shellac cured, I rubbed it with clear paste wax & steel wool, and installed it. Also, the original had these two homemade metal braces, for added stability, and I cleaned the rust and dirt off those as well, and re-used them. So that's that. Yes, I know, the floor needs refinishing, and the whole room needs to be re-done. I'll get to it! What I liked about this project is being able to use my woodworking skill in doing some home improvement stuff. This isn't fine furniture, nor is it restoration exactly. But using my skills to preserve and enhance an original, or at least pretty old, feature/fixture of my house is very satisfying.